Substitute Included Tray With: No Substitution. I'll Keep the Standard RAM-234-3 Tough Tray. RAM-246U 4.75" Sq. VESA 75/100mm Hole Pattern [Subtract -$25.20] RAM-2461U 3.68" Sq. VESA Plate 75mm Hole Pat. [Subtract -$28.65] Contact Me - I Need Help Finding a Tablet Cradle. 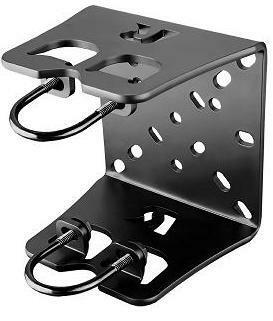 RAM-VB-184T-SW1 is a universal multi-function COMMERCIAL vehicle laptop mount system that includes the vehicle base, lower/upper tele-poles, 12 inch articulating swing arm and Tough Tray for Medium to Large sized electronic devices. NOTE: Please call 224-578-9162 or complete the product inquiry form by clicking here to ask questions specific to your vehicle. NOTE: Click here to view Airbag Safety and RAM Mounting Systems (Adobe required). RAM-VB-184 Base U-Bolt Dimensions: Accommodates rail diameter tube from .625 inch to 1.5 inch diameter. Base Description: Truck fleets world wide will appreciate the well crafted universal Multi-Function vehicle base now offered by RAM. Considering the wide variety of seating arrangements in the commercial vehicle market, this new vehicle base is reversible by design. Now installers don’t have to choose between locating a flat surface or round tubing to attach to under the vehicle seat. RAM has you covered with either configuration. Tubing framed seats can be attached to in minutes using the supplied u-bolts. Once in place and safely secured, several hole patterns are available allowing the freedom to choose how best to create your custom mounting solution. Steel box frame seats need only four discrete holes drilled to secure the base. 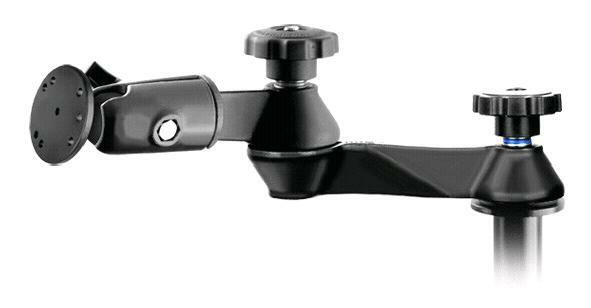 RAM-VB-184 Hardware Included: Supplied u-bolt hardware, attach any number of RAM pedestal mounts to create a mounting system unmatched in its versatility and stability. Hardware NOT INCLUDED: Hardware to secure the RAM-VB-184T-SW1 base to the flat surface is not included. 4 bolts/nuts are recommended to secure the base. Telescoping Pole Included: "Tele-Pole" showed assembled with bottom tele-pole RAM-VC-PF-85 and upper tele-pole RAM-VB-TTM8U (far left picture below). 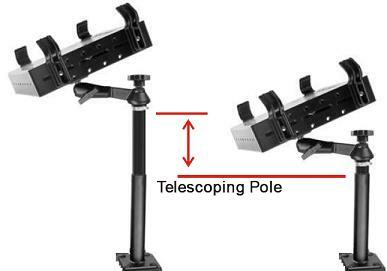 The tele-pole allows a height adjustment range from 11 to 16 inches. For an even more custom installation, the tele-pole may be easily cut with a hack saw to a more desired length. Upper Tele-Pole: RAM-VP-TTM8U black powder coated steel 8 inch upper tele-pole mates to the articulating arm and lower tele-pole. Upper Tele-Pole Dimensions: A = 1.328" OD, B = 2.5", C = 8"
Lower Tele-Pole: RAM-VC-PF-85 black powder coated steel 8.5 inch lower tele-pole mates to the upper tele-pole and vehicle base. Lower Tele-Pole Dimensions: A = 1.375" OD, B = 3.5", C = 8.5"
Articulating Arm Included: RAM-VB-110-1U black powder coated steel dual swing arm with 12 inches of total extension. Connects to the Tough Tray and upper tele-pole. Tough Tray Included: RAM-234-3 Laptop "Tough Tray" high strength composite spring loaded expandable tray. Accommodates laptops from 9.625 to 16 inches wide (screen sizes up to 17 inches). The tray includes 4 side clamping fingers with rubber grips. The fingers are fully adjustable and can be moved both vertically and horizontally. Tray Width (Expansion): 9.625 inches to 16 inches NOTE: Works with most 17 inch screen laptops. NOTE: RAM MOUNT RECOMMENDS the optional RAM-234-SNMU Safe-n-Secure kit shown below if the laptop mount is intended to hold an electronic device while the VEHICLE IS IN MOTION. Options including screen supports (keeps computer screen locked in position, most popular option), flat side arms (allows computer lid to close flat while in the Tough Tray), power caddy (holds power supplies), Secure-N-Motion kit (recommended by RAM when laptops are secured in the Tough Tray while driving), USB computer light, printer mounts (Canon, Epson, HP, etc) and more! Click the links below to learn more. Click here to view Tough Tray accessories (i.e. Screen Support). Click here to view Tele-Pole accessories (i.e. Remove-A-Pole). Click here to view all printer mounts. Click here to view all laptop accessories. 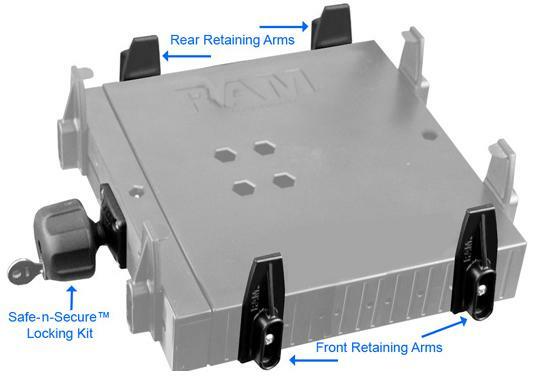 Click here to view the RAM Mount Vehicle Laptop installation video. NOTE: If your vehicle is equipped with an airbag sensor under the seat disconnect the sensor before installing the vehicle base. (If unsure contact your local car dealer.) The video shown is for installation reference and may show additional or less parts than your vehicle base (RAM stabilizer foot that attaches to the base/lower tele-pole as shown in the video). Simply follow the video without installing these components if your vehicle base does not include these parts. Your vehicle base may connect to the seat track bolts differently than shown in the video. The instructions shown to install the RAM tele-pole system, swing arm assembly and Tough Tray are the same for all RAM No-Drill laptop systems regardless of the vehicle base used. Adjustable 24 Inch Stabilizer Leg for Tele-Pole Laptop Power Caddy for Tough Tray USB Computer Light Universal Spring Loaded Tough Tray II for Medium Sized Devices (Netbooks, iPads, Tablets) - Fits Device Width from 8.56" to 11.12"
Price $238.99 + Free Shipping and Laptop Accessory! Price $275.49 + Free Shipping and Laptop Accessory! Price $247.49 + Free Shipping and Laptop Accessory! Price $241.99 + Free Shipping and Laptop Accessory! Price $246.49 + Free Shipping and Laptop Accessory!